Star Wars merchandise has been in the news a lot lately, both for good and bad reasons. Mostly though, the headlines are about people’s passion for the series, and wanting to own a piece of it. And there are not many pieces as amazing as the one you see here. 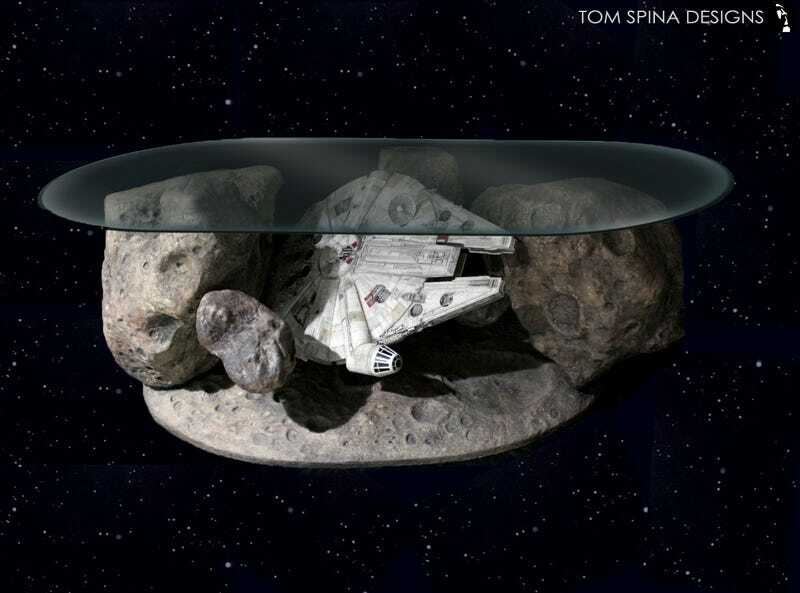 What you see is a custom made Millennium Falcon coffee table by Richard Riley at Tom Spina Designs. The bad part about this table is you can’t just cash in your life savings and buy it right now. Someone conceived it and hired this company to make it. It’s theirs. And we’re very, very jealous of them. Nevertheless, that thing is simply beautiful. Check out some more detailed photos below, including almost exact replicas of the asteroids in the film, a painted Hasbro Falcon and even a TIE Fighter on its tail.